MSIEXEC.EXE /I 7z920.msi TRANSFORMS=7-Zip_Customizations.mst /norestart /qb! And that’s about it! You should be up and running with latest version of 7-Zip installed. I keep receiving an error that states “A network error occurred while attempting to read from the file C:\7-Zip\target.msi” What am I doing wrong? What’s target.msi? Is it just 7z920.msi that you have renamed? What’s the command you’re running to get 7-zip installed? Can you paste it here? Also, can you simply double click on the 7z920.msi and get it installed that way? Does it work? I’m using MDT and the error I’m now getting is unexpected return code 1639. 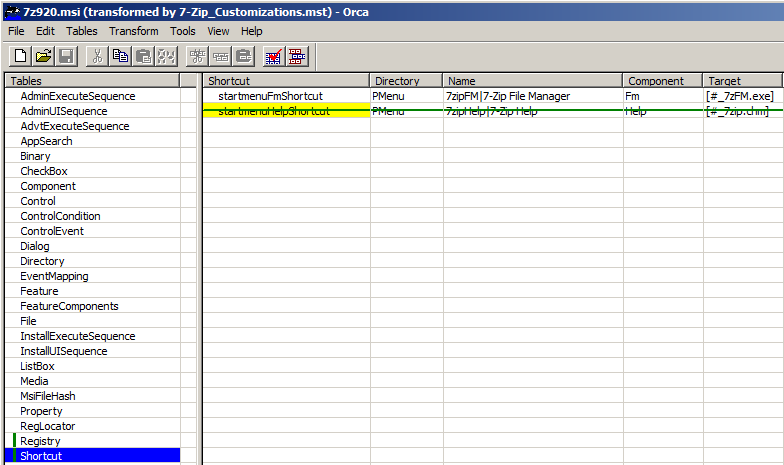 This is my command MSIEXEC.EXE /1 7ziplog.txt /i 7z920.msi TRANSFORMS=7-Zip_Customizations.mst /suppress /qb! Oh, and yes, the MSI file does install correctly. I’ve changed the install command a few times after the original failed to deploy, and the one I previously posted was my most recent attempt. I ended up copying the 7zip .msi file and making an additional .msi file in the same folder named target.msi. For some reason this is the only way it will allow me to install from my network drive. The mst file is perfect, by the way! Thanks for everything. I looked for a contact page but did’t fine one. Your transform has all the file extension associations in the registry table which will work but isn’t the approach recommended for Windows Installer packages. Extensions should be registered in the Extension table with associated in the MIME, Class and ProgID’s tables. I need to get this working for a customer so if I go down the path of association the extensions for deployment I’ll share my output. Please do share your output once you have it – I’m always willing to learn.